I hope you are all good. I don’t have time to write much as I am busy, busy, busy! But it’s the end of August (What happened to the summer? We didn’t seem to have one here!) 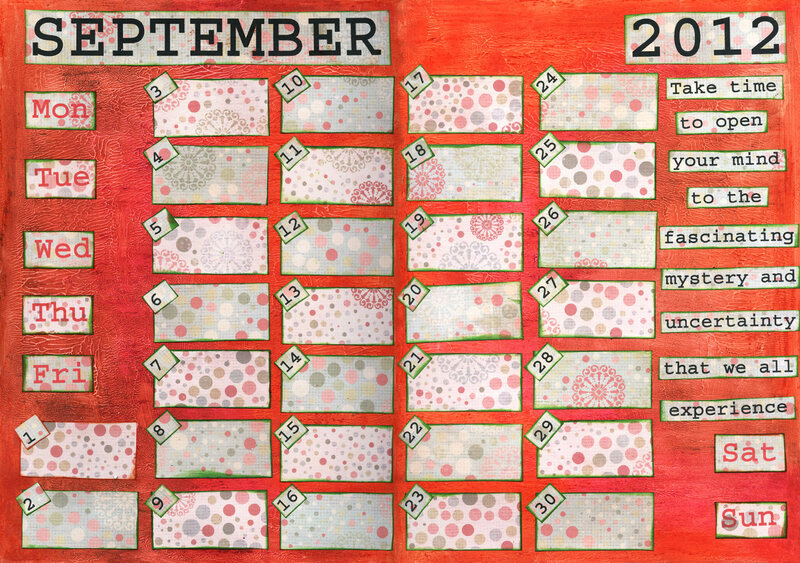 and it’s time to post my new calendar page for September which is part of Kate Crane’s Calendar Challenge. I am just about managing to keep up with it and, as we have now completed 8 months, I think I will make it to the end of December. 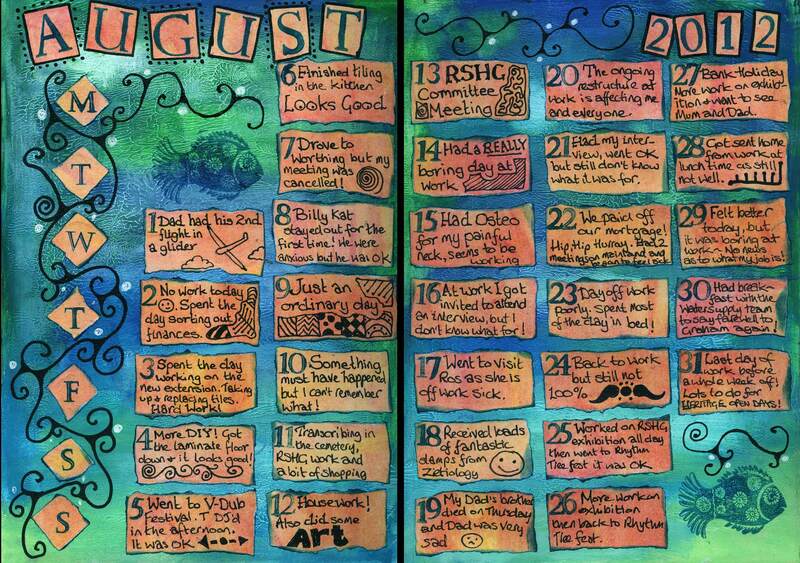 And here is my completed page for August. Right, I’ve got to go, I’ve got loads of printing and laminating to do this evening. PS Still no news on the job front and I’m off work for a week now so won’t find out until mid September at the earliest! So the quote on my September page is really appropriate. I hope you are having a great weekend, it’s sunny Sunday here in my part of the world and tomorrow is a bank holiday – yay! 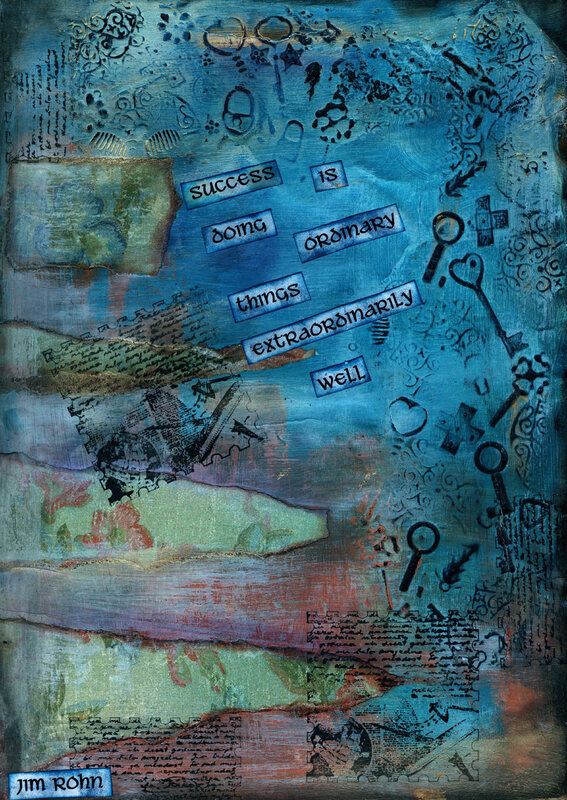 This spread is from my 6 x 6 journal, I started by covering the pages with scraps of paper and ephemera, then added paint and inks. The swirly stamp is one I got free with a magazine. 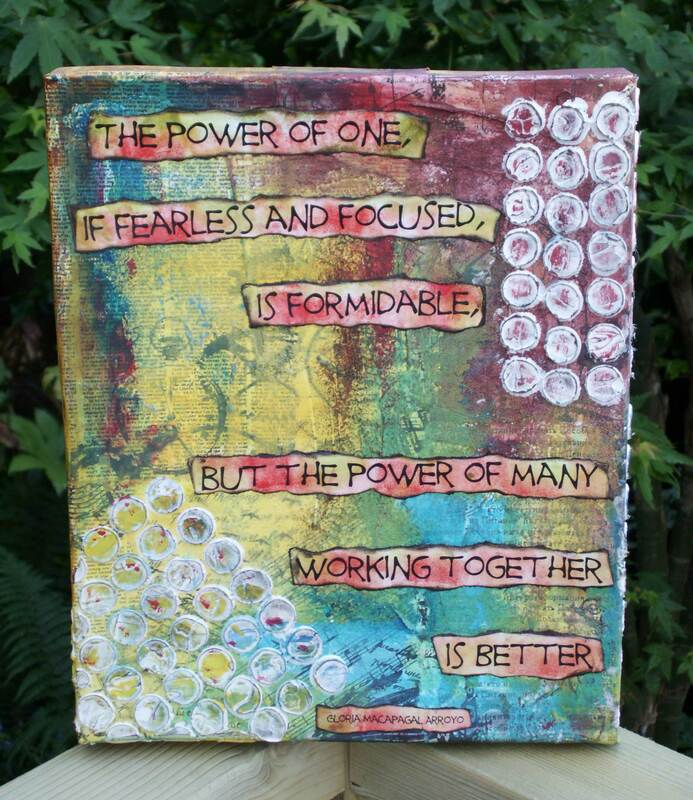 I did some embossing and added the quote which is from the Merchant of Venice by William Shakespeare. Shakespeare is supposed to be England’s finest writer, but unfortunately I was turned off him when I was at school. We had to study Julius Caesar for an examination and the teacher got us to read some parts of it out loud in class. I remember her shouting at me “Say it with feeling!”. The trouble was I had no idea what I was reading, it was like a foreign language to me. I think maybe a bit of instruction and explanation would have helped, shouting at me certainly didn’t! I am going to try and keep up with my blog over the next couple of weeks, but Heritage Open Days starts on 6 September and there are still many things to sort out, so I may have to take a bit of time out. We can get into the venue, an old church, next Saturday morning and then we have 5 days to clean and tidy the place up, transport and set up a huge exhibition ready for the opening at 11am on Thursday 6 September. It’s going to be great but it is also going to be a lot of hard work. If I disappear for a while please understand, I will still be trying to do bits and pieces of art when I can. I’m not so good today and have taken a day’s sick leave from work. I had two long days on Tuesday and Wednesday. On Tuesday I went for my interview, still not really understanding what I was being interviewed for. I think it went OK but won’t find out for a couple of weeks what they have decided to do with me. Yesterday I had to attend two meetings on the mainland and didn’t get home until 8pm. I was struggling to stay optimistic and cheerful yesterday, but I think now that was because, although I didn’t know it, I was already unwell. Today I didn’t get up until about 3pm and I’m still not feeling good, but you can’t lay in bed all day can you? This page is from my A4 journal and is opposite the one I posted last time, the colours match but they are not really what I would call a spread and were done months apart. On this page I used Fimo light on parts of the page and pressed a load of trinkets and keys into it while it was still wet. I made the page quite warped but I don’t mind that. I used blue, orange, black and gold acrylic paints; stamping and scrap book paper. I hope you like it. I’ll be back soon, hopefully feeling better and in a lighter frame of mind. This is probably the most summery weekend we have had all year and I’ve been stuck inside working away on my computer preparing stuff for the history exhibition in September. Never mind, at least I didn’t get sunburnt and at least it is nice to look out the window and see bright light. 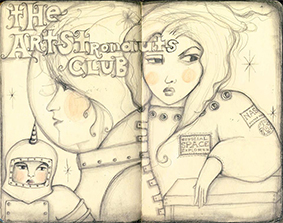 The image above is just a single page from my A4 journal. 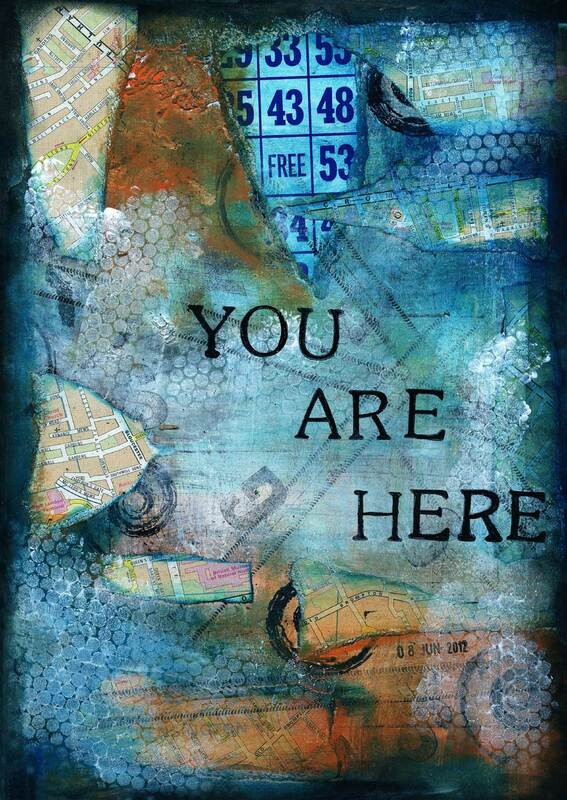 I used quite a lot of ripped up map for the background so I thought You Are Here was an appropriate quote. The criss-cross lines I made by inking up a wheel from toy car and running it across the page. On Tuesday I have to go for an interview at work so that, in 30 minutes, my competencies can be assessed and then I think I will just be slotted into a job where they (senior managers and HR) think I will fit best. It’s all a bit strange really especially as I have already applied for a post that was advertised internally but that’s not what they are interviewing me for. Anyway I have decided that I just need to do some preparation, go along, do the best I can, not get too anxious about it and try to enjoy the experience. I’ll let you know how I got on next time I post. I think it must be quite a tough interview because the 5 managers I work with have already been through the process and 3 of them have not been reappointed to their roles. I already know I am not going to be reappointed to my role as it is disappearing into vapour in the restructure, but I will definitely still have a job. So there is definitely something new for me just around the corner. Exciting or what! OK I am going to drag myself away from the computer now and the many things that I am supposed to be doing and I’ll go and see if Mum and Dad want to come out for a drive and an icecream. I hope your week is going well. Mine is very strange, there is quite a lot of tension and concern at work, it’s becoming a slight struggle but I’m still being positive. I am just having to give myself more and more pep talks. I’m a day late with this post! How did that happen? I think it’s because I went to an Osteopath for some treatment yesterday so my routine was not as usual. I guess that’s where I got mixed up. I can’t believe how fast this weekend has gone and that tomorrow I will be back at work again! Yesterday I did some transcribing in the cemetery then I went into town (just down the road) and did some shopping. After that I spent the rest of the day producing information sheets about the ten year history of Ryde Social Heritage Group. Today I did housework and washing, checked and printed out the information sheets, went to see Mum and Dad, and just about managed to squeeze in a short time for some art. And now the weekend is over! There is still a lot of uncertainty at work but I am staying optimistic, it just feels like a change could be good. The textured canvas above is something I did on 21 Secrets. The ‘canvas’ was made from a workshop by Alma Stoller and the texture effect from a workshop by Christy Tomlinson. When I did my presentation on Employee Engagement recently I was told that I needed to take a prop with me. I had no idea what to take and I ended up making this piece of art and I was very pleased with it. As it turned out though the prop was not required and no-one saw it. Now the ‘canvas’ is sitting on my window shelf at work. Have a great week everyone, I’m just going to help round up and feed a couple of naughty cats before it gets dark. 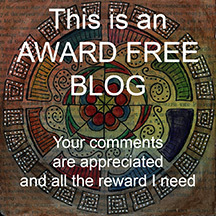 This is (fanfare of trumpets and drum roll) my 100th post! Who’d have thought when I uploaded my first post that I’d still be here now? Not me! If I had more time I’d organise a party, but honestly I’ve got so much to do before September 6. Ryde Social Heritage Group is having it’s 10th Anniversary celebrations. I just need to keep doing things and ticking them off on my massive ‘To Do’ list so I don’t get stressed about it. Anyway, I’m rambling, I wanted to thank all of you for your lovely comments and ‘likes’ but especially for sharing your art. 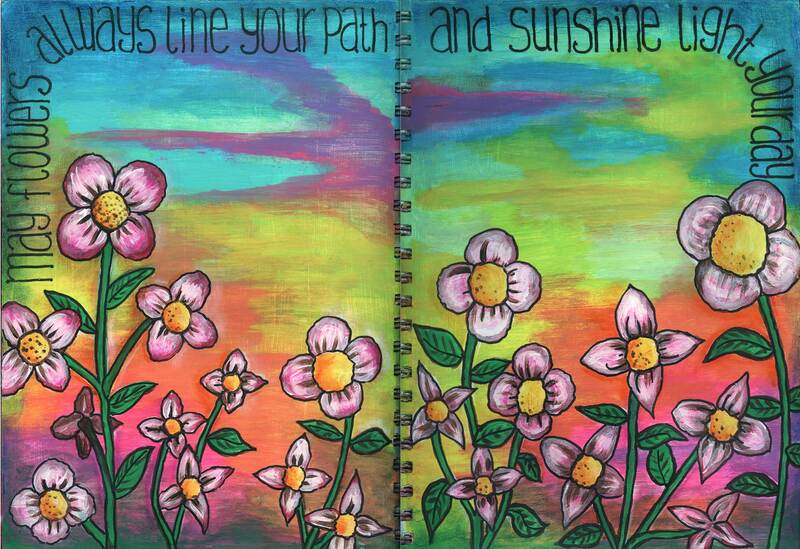 The worldwide community of art journalers is so inspiring, friendly and supportive. I am so happy that I can go online and see loads and loads of beautiful art and people sharing and showing their processes, and grateful to you all for the encouragement you have given me. This spread is from my 6×6 journal, the background was gesso’d and then I used some strange oil pastels (I think) to add colour, they were a bit odd and I wasn’t happy with the result. I looked though my box of cuttings from glossy magazines and selected the images which I collaged on top of the background and then I doodled all over it. I like this spread because it’s colourful, it has fish in it and all the words that are important to me right now. Enjoy the rest of your week and I’ll be back soon.